On a work surface, use paper towels to peel away the white membrane (silverskin) on the back of the ribs. 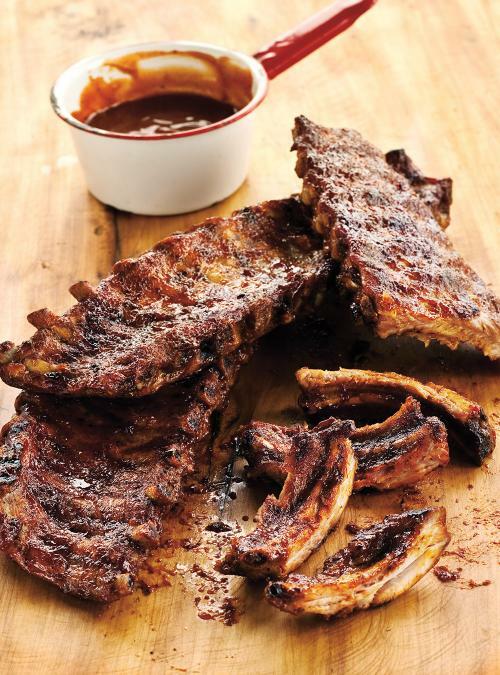 Place the ribs on a baking sheet and rub both sides generously with the spice rub. Cover and refrigerate for at least 1 hour, or overnight. With the rack in the middle position of the oven, preheat the oven to 325°F (170°C). Wrap the ribs, two racks at a time, in heavy-duty aluminum foil. Transfer to a baking sheet. Bake for about 2 hours, or until the meat is tender. Meanwhile, in a small saucepan over medium-high heat, cook the spices in the butter for 1 minute. Add the remaining ingredients, bring to a boil and simmer over low heat for about 5 minutes or until the sauce becomes syrupy. Season with salt and pepper. Preheat the grill, setting the burners to medium. Oil the grate. Remove the ribs from the foil and grill for 4 to 5 minutes on each side, brushing with half of the barbecue sauce. Serve with the remaining sauce. Hard time finding apple jelly, but found Jody’s home made apple jelly from Truro N.S. at Sobeys.I cut the rib in serving size pieces about 4 rib bones put the trivit in the pressure cooker with a cup of apple juice for 20 mins.No need to remove the silver back.Another excellent Ricardo recipe! I forgot to add in my previous comment - I cooked these in the oven. I put the dry rub on the ribs overnight, wrapped in foil in the fridge. The next day I spread the sauce all over the ribs and wrapped them very well in foil. Cooked slow and low, 300 degrees for about 3.5 hours. I started checking at 2.5 hours but the rack was thick and took longer than usual. GREAT results. I created an account just to rate this recipe. It's AMAZING. Not too sweet, not too tart, nice blend. It's perfect. The only changes I made was reducing the salt by half in the rub, and I didn't have any type of jelly or jam on hand and wasn't going to buy some just for this so I added 1/4 cup of sugar instead. 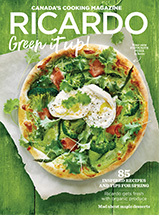 Ricardo's recipes are wonderful but this one is stellar. You can find Apple Jelly at IGA, I think people are looking for yellowish jelly but they are red like strawberry jams. They have at least 2 different brand Apple jellies in the peanut butter/ jam aisle at IGA, plus they have in Season some lesser known brands made in Rougemont. I use Dora Apple jelly. IGA extra at least always have it in stock. The BBQ sauce keeps for a very long time in the fridge. I put mine in a masson jar. Think about it, all of the ingredients you put in it have a long shelf life. Made these ribs on a charcoal smoker at 225degrees. Dry rubbed sat in fridge overnight, smoked for 1st hour only(did not want to overpower the rub flavour) 5 hours then sauced and wrapped in foil 1 Hour. Won a small competition. This recipe was the difference. The point is you can use several methods and still gets great flavour with this recipe. should put Ricardo's name on the trophy ;) . If I could give this 11 stars I would! I've made these ribs twice so far and they were a HUGE hit each time. I let the ribs marinate with the dry rub almost 2 days in the fridge then cooked them in my Instant Pot. I finished them off under the broiler. Absolutely Delicious! Thanks for the recipe Ricardo! These are the best ribs I've ever made. The apply jelly gives them a great taste. I did not make any changes. This will be my rib recipe from now on. These are incredible! No need to look any further for the perfect rib recipe. This is it! C.M. 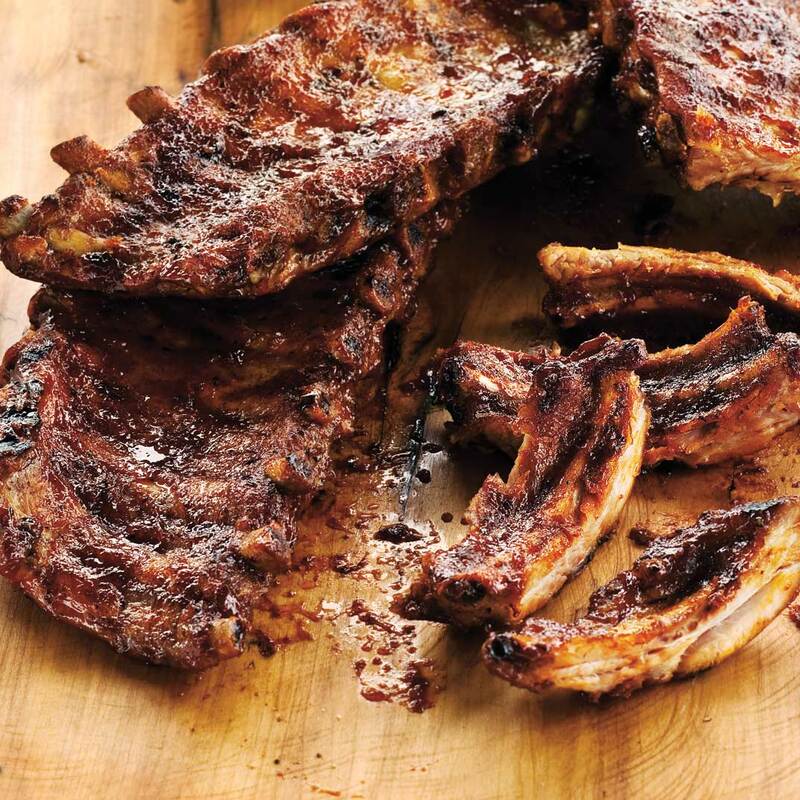 This is my ‘go to’ recipe for ribs, I have made it numerous times and it is always DELICIOUS!!! The sauce is easy to make, not too sweet and is excellent on chicken as well. Today I used homemade grape jelly as I am out of my homemade apple jelly and it was just as delicious. Simply divine. We used a store bought BBQ sauce but turned out incredible. Not the healthiest but definitely the tastiest! 5 stars! Fantastic results. Apple jelly has been hard to come by, but I've substituted both fresh stewed apples and fresh crushed pineapple with great results. I like to double the BBQ sauce recipe and freeze the remainder to slap on burgers and steaks. Delicious! Dad wasn't the only one who loved it--we all did! Definitely worth the added time. Plan to make up packets of the dry rub and sauce to give as gifts, with the recipe, of course, Keep up the good work--we love it all! I thought I would try this recipe for a dinner party and I definitely was not disappointed nor were my guests! This recipe is outstanding and will definitely be my go to for ribs. Ribs were moist and the sauce delicious. Can't wait to use it again.